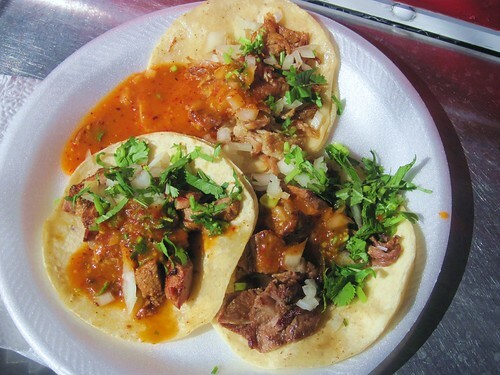 The corner of Redondo and Adams at the R Bodega Market has been claimed by different taco trucks over the years. A couple years ago it was Leo's and Don Jose but I haven’t seen either at this corner in ages. Nowadays Tortas Ahogadas Guadalajara is the lone truck during the day. At night Tacos El Primo parks in the alleyway just North of Adams. Judging by the name and the other orders I saw being prepared the tacos at Tortas Guadalajara may not be the main event but I was pleasantly surprised. 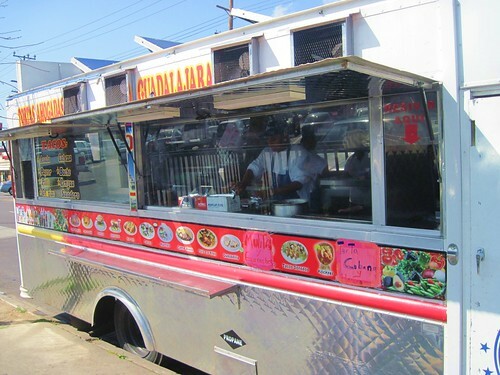 With LA taco trucks there is greatness which is rare, there are the truly dreadful trucks that you wouldn’t allow your dog to eat off of and in-between there is the vast middle - tacos that while not great by any means have something about them that is satisfying. Maybe it is eating on the side of the road that makes them more pleasurable than they should be but whatever it is sometimes average tacos under the right circumstances taste very good. Tortas Ahogadas Guadalajara is really known for their namesake, the Torta Ahogada which is a torta drenched in hot sauce. I had never heard of this delicacy until I read the review at losanjealous . It sure does look like a delicious mess. I’ll have to give it a go heartburn be damned.